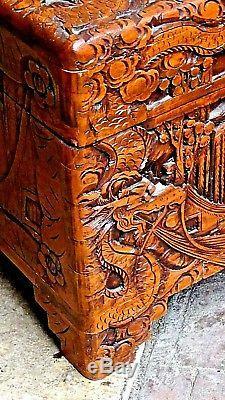 ANTIQUE CHINESE CAMPHOR WOOD HAND CARVED BLANKET CHEST. 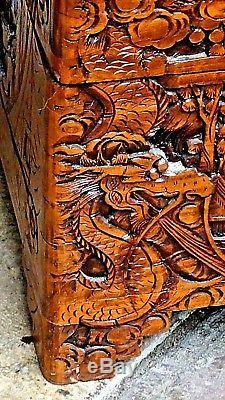 BEAUTIFUL CARVING IS ALL OVER ALL SIDES WITH A DRAGONS , LANDSCAPE AND BATTLE SCENES AND VILLAGES ON BACKGROUND. CONDITION GOOD;MINOR AGE WEAR(SEE PICTURES). 29.5"L x 15"H x 14 DEEP. The item "ANTIQUE CHINESE CAMPHOR WOOD CARVED DRAGONS & BATTLE SCENE BLANKET CHEST 29.5L" is in sale since Friday, March 30, 2018. This item is in the category "Antiques\Asian Antiques\China\Chests". The seller is "silkboxing" and is located in Renton, Washington. This item can be shipped worldwide.